Having a formally defined ICT policy indicates that a business is aware of the risks to which their ICT systems are potentially exposed. Having such a policy implies a strategy to safeguard data and infrastructure, Eurostat says. 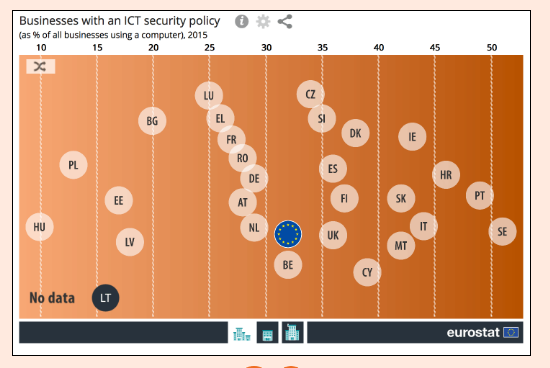 Nowadays, practically all businesses in the EU (98 %) use computers and among those, only 32 % have a formally defined ICT security policy. For large businesses, this share reached 72 %, while it was less than one third for SMEs (31 %). In 2015, according to Eurostat, less than 35% of Czech businesses had ICT security policy in place, but this is still above the EU average. More.